I was searching for an interesting restaurant to visit for my Abu Dhabi visit. I had seen another outlet, but had dropped the idea since it was a bit out of the way. I was visiting Ferrari World, and on the way from the parking lot, this restaurant coincidentally caught my attention. 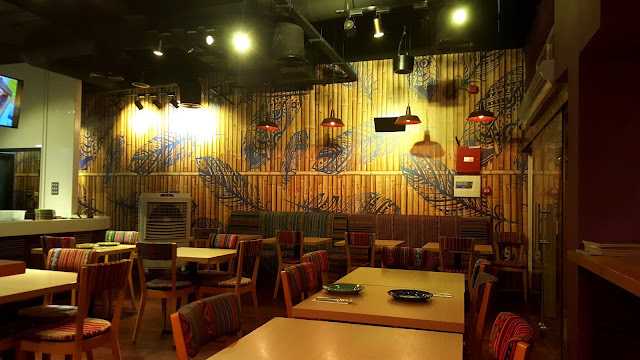 It serves African and Portuguese cuisine which is something different and so I wanted to try it out. We had a look at the menu and they had some mouth-watering dishes. Some of them looked similar to the ones served at Nando's, but cheaper. To start with, we ordered a chicken Sosaties. It is chicken skewers. Boneless chicken thigh cubes that are flame grilled. They smelt lovely when served. They tasted delicious too. They were soft and juicy; and also a bit spicy. They are served with a creamy barbeque sauce. I will certainly recommend these. Next, we ordered the chicken strips and rice combo. It was served along with a cheesy garlic bread and ice tea. I was passing by Jumeirah road when I saw the word "Döner" and it caught my attention. It was also a bit secluded from most restaurants and since I wanted something which wouldn't be as crowded as most of them, this was a good choice. The restaurant pretry small inside. It has seating for about 10 people inside. There's outside seating too, provided the weather permits. 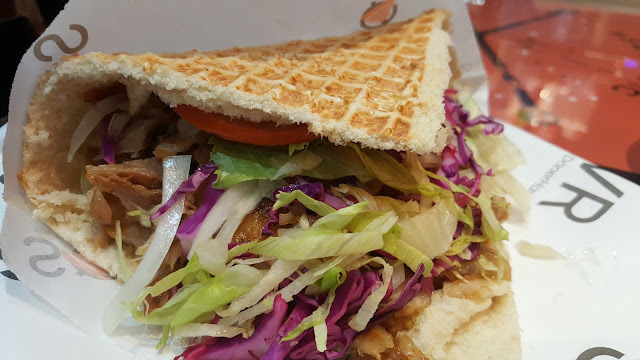 We ordered one classic Döner. This one looked really attractive when served, but all the meat kept falling out and there was no convenient way to hold it. The taste was good though. We also ordered a mix meat sqwr box. This one was good. The different meats in it tasted good. They also give you a little salad on the side and three sauces and you can choose whichever you like as per your preferences. For drinks we had the lemon mint juice which was good. For an additional 2 dirhams, you can make it bottomless. This place is situated on one of the quieter patches of the Umm Al Sheif Road. There aren't too many establishments around, and I think people hardly know about these restaurants. I stumbled across this one as it had a unique cuisine - Peruvian. The place was secluded when we went there; and we were the only customers here. The ambiance is laid back. They've used a lot of blue and yellow / brown shades. The dishes on the menu were all new to me and I hadn't heard them before; but the good this is that it has a description so you get a fairly good idea about what the dish would be like. To start with, we ordered a quarter combo, and a Peruvian tamal. The quarter combo consists of a 1/4th grilled chicken served along with fries and a salad. The chicken was great. It was flavorful and well-cooked. It was served with four sauces - mustard, garlic, mayonnaise, and a spicy one. I loved the spicy sauce. When I first read the name while looking for some healthy places online, I found it a little weird, but at the same time catchy. 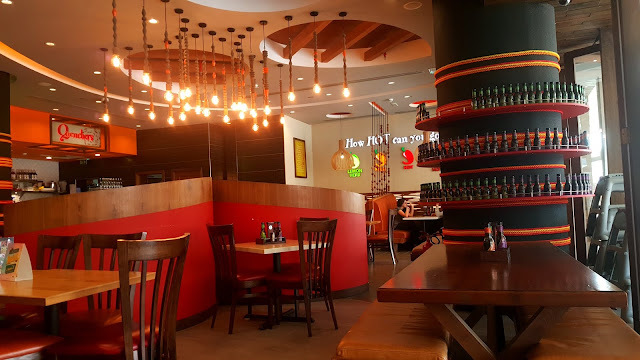 I expected it to be a really small place; may be something like most of the Malbari cafeterias in Bur Dubai, but upon entering I saw that it is way better than I expected. 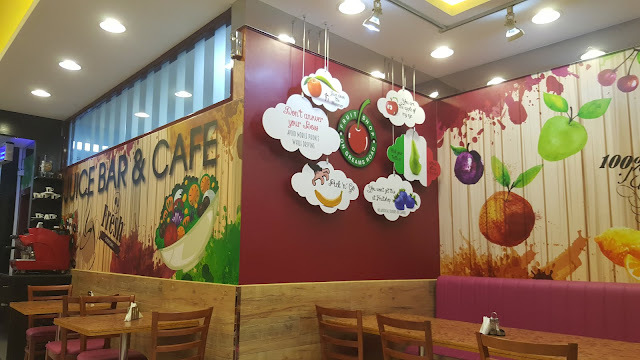 They interiors were bright and colorful with posters of attractive fruits. The name comes from their first branch located on Greams Road in Chennai. The menu looked interesting and has so many items that you'll be spoilt for choice. After much pondering we asked the waiter for recommendations based on our preferences. He recommended the Jughead special smoothie. He didn't quite describe what it had but he was sure we'd like it. When it was served, sure enough it looked tempting. It had some honey, dates, and lots more to it. It had a creamy consistency and was really delicious. Having heard a lot about this place that is pure vegetarian, I decided to check this out with my folks. As soon as you enter you get a very welcoming and traditional feel. We went here on a weekday afternoon and the place was empty. We were the only ones there until a couple entered later, and the place felt very calm just like we desired. As some of you might have guessed from the name Sai Dham, this place has photos and quotations by Sai Baba. We started with some chaat items. We had a dahi puri and a sev batata puri. They served it in the afternoon too, unlike some restaurants who start their snacks only in the evening. Both of the items tasted really good. They were made well and were filling too. For the mains, we had a stuffed simla mirch and a subz tawa. Saravanna Bhavan is one of the famous names in South Indian food, and I've been there quite often. This time I visited their Barsha outlet. 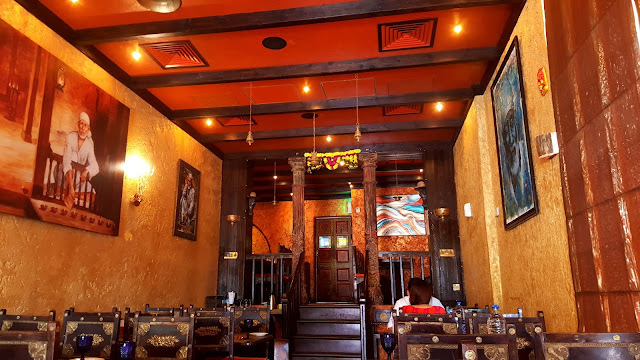 This one too has the look and feel of the other outlets, and gives you a feeling that you've come to an authentic South Indian place. It was afternoon and it was fairly easy to find a parking spot. We ordered a Thali and a special Biryani. 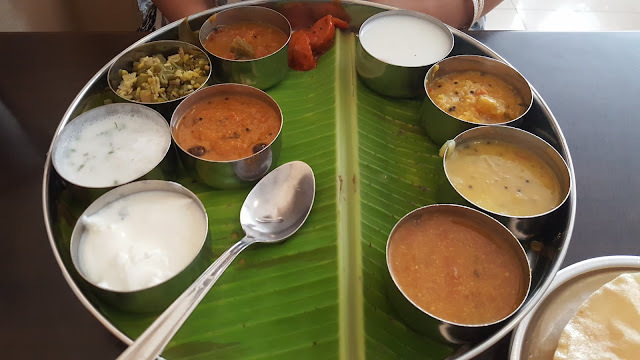 The thali consists of sambhar, a dry vegetable, 3 vegetables with gravy, rasam, buttermilk and a sweet. There is also poori & rice with it, and papad & pickle. They serve it the traditional way, i.e. on a banana leaf. The banana leaf though is placed inside a plate since many aren't used to eating it that way. The thali is really delicious and also very healthy. After this, the biryani felt a bit out of place. The biryani was more of a spicy pulav. It had some dry fruits, paneer, and mushrooms in it. It tasted very good, but a little different from what I'd expect form a biryani.